Nylas N1 - Best Mail Client for Linux, Thunderbird Alternative --N1 is open source free software, licensed under GPLv3 for the mail client program. 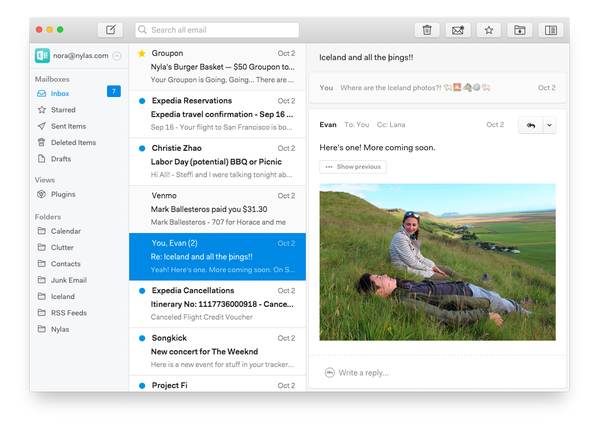 N1 is an open-source mail client built on the modern web with Electron, React, and Flux. It is designed to be extensible, so it's easy to create new experiences and workflows around email. N1 is built on the Nylas Sync Engine which is also open source free software. One of the key reasons we were able to develop this app quickly was that it uses the Nylas Platform APIs, powered by our open source sync engine. This moves the complexity of mailsync to the server infrastructure. N1 is compatible with the same providers as the Nylas Platform, including Gmail, Yahoo, iCloud, Microsoft Exchange, and hundreds of others. How is a N1 plugin different from Gmail.js or other Chrome Extensions? Plugins in N1 are built on fully-supported APIs that are end-to-end tested. It’s an actual development platform with libraries, tests, UI components, and more. Check out the docs for more details. Click twice on the downloaded file, the "Package Installer" window will appear. Click on the "Install Package" button and enter your password if prompted. Wait until installation completed. Done! For the first time usage you need to dig it. Step by Step How to Install & Setting Thunderbird Mail Client for Linux. Thunderbird is a free email client which available for Linux, Mac, and Windows --easy to configure and customize - and it’s loaded with great features! Mozilla Thunderbird mail client for Linux makes email task faster, safer, and easier with features such as intelligent spam filters, a built-in RSS reader, and quick search. Thunderbird was designed to prevent viruses and to stop junk mail. With Thunderbird you can read email offline. Thunderbird includes tabbed e-mail, new search tools and indexing, smart folders, support for Firefox, a simplified setup wizard and robust junk protections that include phishing and spam filters. Mozilla Thunderbird provide many functionalities to email for offline reading for free without access to robust paid software such as Microsoft Outlook. Thunderbird allow you to integrate multiple email account by configuring its SMTP or POP protocols, Thunderbird is a lightweight, responsive piece of software that works well. Thunderbird Mail and the program will appear. If your system doesn't install Thunderbird by default you can install it manually by downloading it from here and extract. Thunderbird is free open source and customizable, you can add any theme and other setting. It also offers all of the basics you need right out of the box, so you don't have to worry about highly complicated technical setup if you're not comfortable working in the trenches of a software tool. Thunderbird has Smarter organization which allow you organize your email as easy as possible. Including tabbed email browsing, smart searches, and custom folders to organize your messages, along with powerful spam filters that are better than a lot of Web-based tools, Thunderbird works well with most email services. Open your Thunderbird program, for the first time you will see "Welcome to Thunderbird" window (please click on "Skip This and Use My Existing Email"). Select Account Actions >> Add Mail Account, please enter your name, email, also password here. Click next or Continue. Click Re-test button to test connection. Once you have success on it click "Done" button. And songratulation you've set your Thunderbird up!